If you're already feeling stretched thin (and not feeling too joyful about it), then it's time to step back and use a few organizing strategies to make a new plan. The holiday season has officially begun -- bringing with it a traditional mix of feelings that range from excitement to misery. When you think about the holidays, do you focus on the positive events that give the season its unique flavor or do you feel paralyzed by the innumerable things you need to do? I counted myself among that latter group until I met and began working with Aby Garvey, a professional organizer and co-owner of Simplify101. Aby has shared her advice with individuals worldwide through her incredibly popular online organizing workshops - and even on Rachael Ray's popular website! I knew I had to ask her to share her tips with Huffington Post readers before the holiday season became -- well -- not as joyful as it should be. Before I turn the post over to Aby, I am thrilled to share some exciting news! Aby and her Simplify101 co-owner and husband, Jay, have recently been nominated as finalists for the Best Organizing Website or Blog in the Los Angeles Organizing Awards. This event celebrates and honors the best of the organizing industry. I'll try not to get too sappy by writing volumes about why I believe Aby deserves this award. Still, I must say that Aby is one of those rare individuals who radiates positivity in all that she does. She works feverishly to help others change their lives, including my own. I would be so grateful if you would vote for Simplify101 online (it takes less than a minute)! For instructions on how to vote, please check out this blog post. The holiday season is an interesting time of year. First, there is an expectation that you will feel joyful. Just look at all of those happy people in the T.V. commercials and you'll see what I mean. Certainly there's nothing wrong with being happy during the holiday season. But this idea that, during the holidays, you should be happier than ever happens at the time of year when you're busier than ever. Your already mile-long to-do list gets inundated with a host of extra projects and tasks: send out holiday cards, buy gifts, wrap gifts, redecorate your home, make fancy meals, attend more social events this month than the rest of the year combined, and do it all with a smile on your face. Now, if being super busy makes you blissfully happy, then you're all set. But if you're already feeling stretched thin (and not feeling too joyful about it), then it's time to step back and use a few organizing strategies to make a new plan. Step 1: Know your priorities. Before the season arrives, have a little chat with yourself and your loved ones. What's most important to you this time of year? What are your priorities? For my family, spending time together is the number one priority. Everything else, while nice, pales in comparison to just being together. This means that when I'm tempted to overdo it on decorating (or any other holiday to-do), it's time to step back and simplify. Then, I can redirect the time I would have spent going overboard on decorating, gift wrapping, etc., back to just being together with my kids and husband. We also decide at the start of the season which activities are most important to do together. Each year the number one pick is cutting down a fresh tree. This means that even though it would be quicker and simpler to go to a local tree lot, the Christmas fresh-cut tree "hunt" is given top priority. I can simplify other tasks--perhaps taking store-bought appetizers to the progressive dinner instead of cooking from scratch--but other tasks and activities will be fit in around cutting down the tree. Step 2: Delete any task you can. If your schedule is already jam-packed with obligations and to-dos, now is the time to renegotiate your schedule with yourself and others. 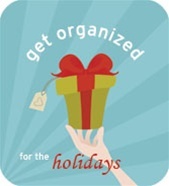 Take a look at your ongoing tasks and activities, and see what can be eliminated or deferred until after the holidays. For example, can you slow down on your committee work until January? Next, take a look at your holiday to-do list, and decide if anything can be removed. While talking to your family about what's most important to them, ask them which tasks and activities they aren't interested in doing anymore, or even just this year. Scratch those activities from your to-do list and smile, knowing you just created some breathing room. Step 3: Let go of perfection. The holidays bring with them the desire to do everything perfectly. Wouldn't you just love to have a perfectly decorated home, and to give the just-right gift to each person on your list? Of course you would, and I would, too. In and of itself, there's absolutely nothing wrong with this desire. The trouble is that to-do list of yours (and mine!). If your schedule is already full, it can be really tough to attempt a perfect holiday and still feel joyful. So, decide which activities are really important to go all out on (notice I didn't say "do perfectly") and then decide which tasks simply need to get done. Letting go of the desire for perfection will not only save you time, but you'll feel better, too. "Done" is better than "perfect," and easier, too. Step 4: Simplify or delegate tasks you don't enjoy. Not every task on your holiday to-do list is enjoyable. Some things you love to do, and others are an energy drain. If you don't enjoy doing a task, look for ways to simplify it, if it's not possible to delete it from your list entirely. For example, I don't enjoy the process of sending holiday cards. I love the idea of sending holiday wishes to friends and loved ones, but the act of taking the holiday card photo, printing the photo, filling out the cards, addressing and stamping the envelopes, and so on, makes me feel quite Grinch-like. When you encounter a Grinch-inducing must-do task on your holiday to-do list, look for ways to simplify the task, if you simply cannot cross it off your list. One great way to simplify a task is to ask loved ones to pitch in. Get your kids in on the holiday card project by having them stamp the envelopes and lick them shut. Or, if you don't enjoy cooking, recognize that this isn't going to change simply because it's the holiday season! Instead, opt for super-simple dishes or store-bought items, and invest your time and energy in the holiday tasks you love to do. Step 5: Keep your eye on the prize. The prize isn't January, by the way. The true prize is simply creating enough space so that you can be able to truly enjoy the time between now and January. Change the rules so that this time of year works for you. And continually monitor how you're feeling. If you're feeling good, you're on the right path. If you're feeling stressed and harried, step back and reevaluate. At the end of the day, the real prize (and my wish for you) is a joyful holiday season. Note from Carolyn: The opinions expressed in this post (and all of my posts) are my own. I will never accept any payment for my personal endorsement. With that said, remember to cast your vote!